Bring glamour into your home with this round wood tray set. Place these charming trays on your entrance console table as trinket trays to hold your keys and other odds and ends as you come and go. These trays can also be used as decorative accents to hold your wine glasses or mugs of herbal tea on an ottoman or on your vanity for make up organization. Constructed of wood, these trays have built in handles to carry your cheese tray and glasses from the kitchen to the living room. The larger tray has an 18 inch diameter and is 2.325 inches high. The smaller tray has an 15.5 inch diameter and stands 2.125 inches high. 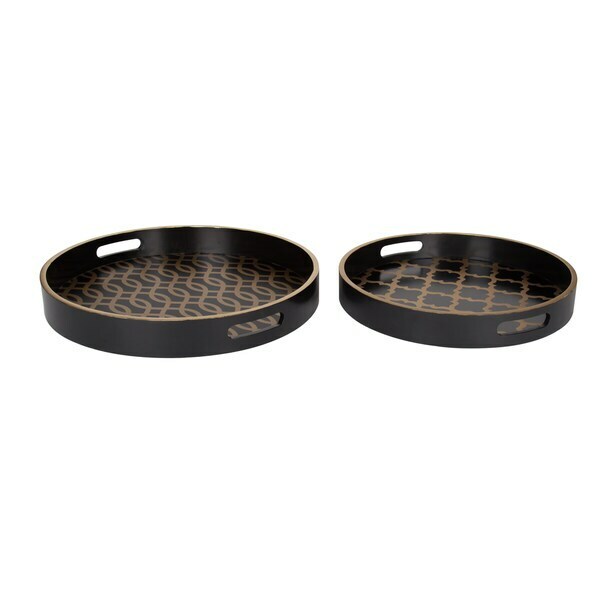 The trays are designed to nest together for beautiful display, easy transport, or storage.